How to run mobile apps on Windows or Mac? To run mobile apps on Windows or Mac you need the application called BlueStacks. BlueStacks is the Application Player that let you run applications from your phone fast and fullscreen on Mac and Windows. At the heart of BlueStacks is a multi-OS runtime with breakthrough virtualization technology. Apps developed for different operating systems can execute simultaneously, side-by-side, on the same computer. BlueStacks employs a lightweight, optimized, soft hypervisor with deep enhancements to support “embedded virtualization”. End consumers can enjoy the full Android environment through BlueStacks, or just install Android app icons directly on the Windows desktop. As is the case with any advanced technology, the complexity is completely masked from the end consumer. The BlueStacks user interface is fully configurable. 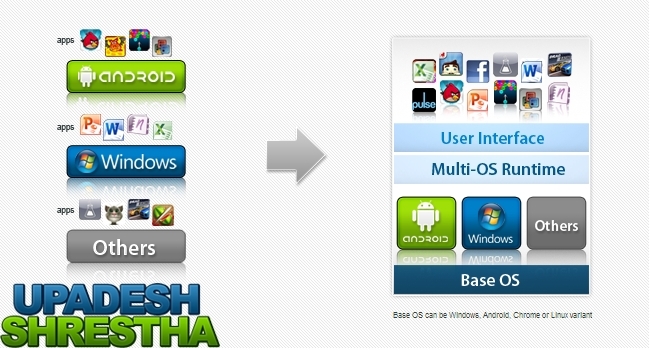 In addition, BlueStacks can integrate with the custom software experiences designed and developed by PC manufacturers. No not really till now. It is a free application. What can I do with this application? BlueStacks to run apps like Fruit Ninja, Angry Birds Space, Wordfeud and Instagram fullscreen which has been used by the people of more than 100 countries. For Windows user Click Here and for Mac user Click Here.